Electric grills have made great strides in recent years, and with no need to buy additional fuel, they have become a convenient alternative to standard models. Many are also suitable for indoor use, adding to their versatility. But what’s the best electric grill on the market right now? This article will take you through our top 5 models, detailing the various features and strengths of each one. Let’s dive in! Why Use an Electric Grill? The Weber Q 2400 Electric Grill is our #1 recommendation. It has the largest cooking area of any grill on our list and delivers impressive heat, while still being compact and potentially portable. The George Foreman Indoor/Outdoor Electric Grill allows you to cook for a crowd, and the easily removable stand means you can use it inside or outdoors. The Char-Broil Electric Patio Bistro Grill is the most traditional looking grill on our list, and its infrared technology ensures even heat distribution and minimal flare-ups. Versatile and programmable, the T-fal OptiGrill XL allows you to set and monitor your cooking at the touch of a button. The Cuisinart ‘Griddler’ works as a grill, griddle, and panini press – it also open up completely to maximize space. Taking our coveted top spot, the Weber Q 2400 is a sleek and powerful unit. With an impressive 280 square inches of cooking space, the Weber is large enough to cook for a sizable group – and the relatively short pre-heat time will get you cooking much quicker than a charcoal grill. Heat is set via a valve on the side, which provides temperature precision, though this model lacks a built-in thermometer. The quality of this Weber grill sets it apart. From the glass-reinforced nylon frame to the porcelain-enameled, cast-iron cooking grates, each component is well-crafted and designed for durability. The cast aluminum lid and body retain heat well, though lifting the lid will allow heat to escape during use. The inclusion of aluminum liners boosts heat retention considerably. The heating element under the grill ensures even heat distribution, preventing hot and cold spots. Able to withstand high heat, the Q 2400 electric grill gives your food fantastic sear marks. Easy to clean, the porcelain-enameled grates prevent food and marinades from sticking. A removable catch pan is also provided to make clean-up a breeze. At 42 pounds, the Weber grill is easy to transport for camping or tailgating. The 6-foot cord is fairly long, but you can always purchase an extension. A well-known brand in the electric grill scene, this model from George Foreman boasts 240 square inches of grill space, enough for 15 servings at once. At just 21 pounds, this grill is light and portable, if need be – it’s a great option for tailgating or an RV. The electrical cord is around 6-feet long, allowing for some maneuverability during use. With an easily removable stand, this George Foreman offers versatility, going from outdoors to indoors in a snap. The countertop stand keeps the grill elevated, protecting your kitchen counters. Temperature is controlled by an adjustable probe, offering 5 different settings depending on what you cook. This unit does not have a built-in gauge to monitor temperature more precisely. However, it does have a temperature control light to indicate when the correct temperature is reached. Patented by George Foreman, this grill features the Fat-Removing Slope. The angled grill plate allows fats to drain away from food, resulting in healthier grilling. The George Tough Nonstick Coating prevents food from sticking and reduces the need for oils during cooking. The grill and drip tray are easily removable for cleaning, with the drip tray being dishwasher safe. This model also features a domed lid to increase heat retention and circulation during use, ensuring even distribution for even cooking. Char-Broil’s Infrared Electric Grill is another standing model that provides a large amount of grilling space. The main grilling area, with porcelain-coated cast iron grates, is expanded by a warming grate, ideal for vegetables and sides. With the infrared grilling technology, there are no cold spots and fewer flare-ups for a juicier end result. The grill lid and firebox are both constructed from durable porcelain-coated steel, designed to withstand heavy use. The lid features a mounted temperature gauge, allowing you to precisely monitor the internal air temperature. Temperature is set with an oven-like knob control, with an illuminated ring showing the grill is hot as an additional safety measure. Each component is easy to clean by design, including the removable porcelain-coated drip tray, accessed at the grill front. One of the heavier models at 54 pounds, this grill is not portable like others on our list. It comes attached to a stand which is not removable and is only suitable for outdoor use. The stand itself features two durable folding side shelves, creating space for prep or storage. Underneath, the stand has a chrome storage rack and a cord management system, keeping the cord protected when not in use. For enhanced mobility, the stand has two wheels should you wish to move the grill into storage or around your patio or deck. 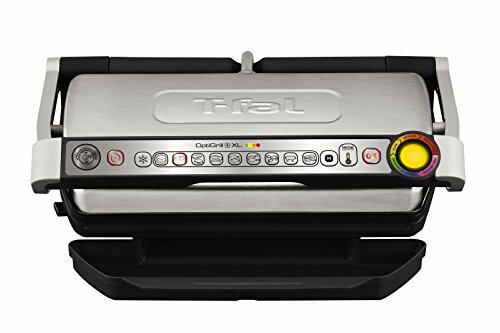 The OptiGrill XL from T-fal is the most customizable grill on our list. With nine different programmable settings, like Burger, Sandwich, and Shellfish, this grill takes the guesswork out of cooking. Four individual heat settings – keep warm, low, medium, and high – further boost the versatile cooking nature of this grill. With Automatic Thickness Measurement, the OptiGrill adjusts to the correct temperature for the size and thickness of the food, depending on which setting you choose. This model also has a setting specifically for cooking and defrosting frozen foods. The OptiGrill features an indicator light when preheated and ready. Audible beeps sound for rare, medium, and well-done so you can easily monitor the cooking process. Die-cast aluminum non-stick plates prevent food from sticking and are easily removed for cleaning. The grill plates slant downward so that excess fat does not collect on the food. Grease is caught by the drip tray – both this tray and the grill plates are dishwasher-safe. The body of the OptiGrill is made from a brushed stainless steel, making it both a useful and attractive addition to your kitchen. 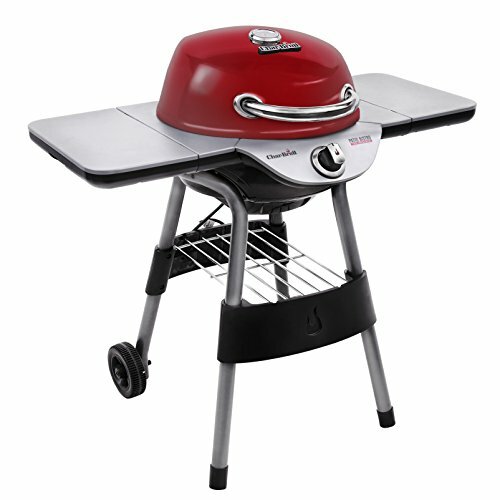 With 124-square inches of grill area and weighing 11.5 pounds, this model is on the smaller side. Its compact style makes it easy to transport, although this model is only intended for use indoors. Intended for indoor, countertop use, Cuisinart’s ‘Griddler’ is an impressive unit with 5 different abilities in 1 package. 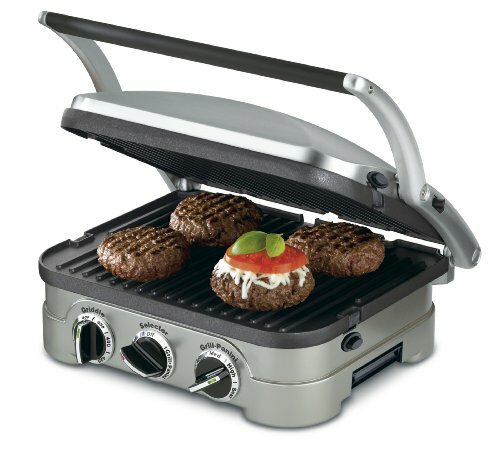 This model can operate as a contact grill, panini press, full griddle, full grill, and half-griddle, half-grill. The floating cover, with safe front handle, is able to lay flat and transform, depending on what you want to cook. 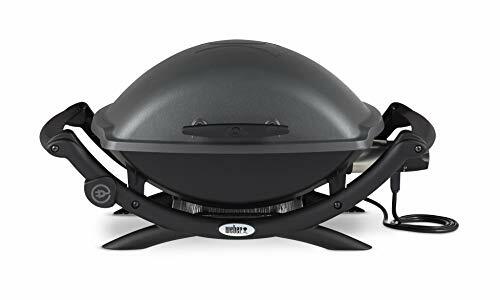 This makes the Griddler perfect for eggs and bacon for breakfast, a panini for lunch, and seared steak at dinner. Three dials on the front allow you to control grill or griddle-panini mode and temperatures. Indicator lights show green and red, letting you know which mode is in use and when the Griddler has reached the right temperature. The hinged, floating cover design allows for foods of varying thicknesses to cook evenly, with full contact. Brushed stainless steel housing looks good and is easy to wipe clean after use. When the full grill is in use, the Griddler offers 200-square inches of cooking space, enough to serve 3-4 people at once. The reversible cooking plates are dishwasher-safe, and this model includes a scraping tool to remove any stuck on foods. An integrated drip tray makes clean-up easier – both drip tray and scraping tool are suitable for use in the dishwasher. The Griddler arrives fully constructed and with a recipe book included. Owning an electric grill means freedom from propane gas and charcoal. You won’t have to pay for fresh bags of charcoal or to fill up your propane tank. Of course you will be using a little bit of electricity to power your grill, but you’ll never have to leave the house to replenish that. And no charcoal means no more dirty, black hands! Electric grills typically create a more evenly heated cooking surface compared to open flames. This is sometimes further enhanced by infrared burners. You can use an electric grill where propane and charcoal grills aren’t allowed or simply aren’t safe – such as indoors and on balconies. Electric grills are designed to minimize smoke. They often direct fat drippings to a tray and away from hot elements. Also, no open flame means no flare-ups. Electric grills are oftentimes easier to clean due features like drip trays. Additionally, many smaller models have removable parts that are completely dishwasher safe! Many electric grills are suitable for both indoor and outdoor use. This means that, generally, grill size and cooking space are on the smaller side. Most electric grills have a cooking area less than 300 square inches, which is smaller than most traditional grills. Consider if you want a standing grill or something that sits on a countertop. Also think about storage – will you be leaving your grill on your countertop or patio, or will you need a place to store it? 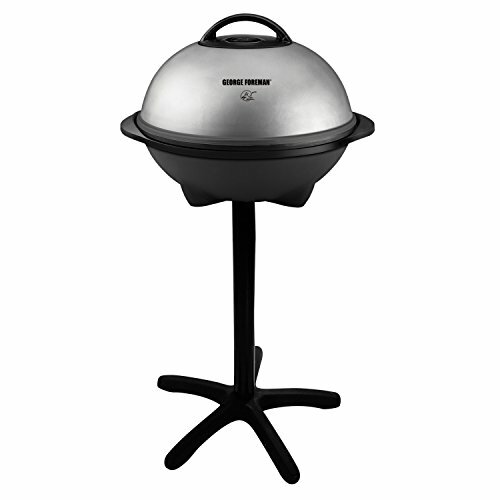 Being small in stature makes the electric grill one of the most portable types of grill. With the ability to connect to a vehicle outlet, an electric grill is ideal for camping and tailgating. Many have handles for easy lifting and are light enough for one person to move. When traveling, the compact size of an electric grill reduces the amount of space it takes up in the trunk. As the grill only needs electricity to run, it is more mobile as there is no extra fuel (propane tanks, charcoal) to bring. You will find that many electric grills have temperature controls, though some will be more precise than others. See if the grill you want has an adjustable dial so you can customize the temperature depending on what you cook. If you want to grill meats, look for a more accurate temperature gauge. Make sure the model can produce and handle high heat for a good sear. Electric grills are often looked down upon or simply overlooked. However, if you want to grill indoors or your community prohibits gas and charcoal, then electric grills can be a great option. If you’re looking for the overall best electric grill on the market, our top recommendation is the Q 2400 from Weber. However, depending on your needs, a smaller, counter-top grill like the Griddler or OptiGrill XL might work best for you. Let us know in the comments which grill you have your eye on!